Diamond Candles recently asked me if I'd be willing to do a review of their candles, with a giveaway for Don't Eat the Paste readers. I love candles. They don't need a special surprise for me to love them, candle light, and a nice scent is going to be enough. The surprise though? That's kind of like being a kid with a box of cereal and a toy surprise except better. All the photos in the collection above were taken by me. They sent me a code to get a free candle for the review. I talked to my daughter, and she chose Cupcake scent. The candles are soy candles, which mean very little soot, and a nice clean burn. Plus soy candles can handle a heavier fragrance load than standard paraffin candles and are more environmental friendly. Because soy is a soft wax, it's perfect for container candles. The candle itself- it has a warm, baked vanilla sugar scent. Nothing too sweet, it's more grown up than that. A very homey scent, with a great throw (how far the fragrance travels while the candle is burning). I could smell this one from 12 feet away. Not a strong smack you in the face scent like room spray can be. Just comfortable. The container- Diamond Candles has a Pinterest board of craft ideas for empty containers. The containers are very nice. All glass with a label that can be removed with a bit of work and a tight fitting lid. Their fans buy candles regularly enough that some have had some very clever ideas for re-use. Mine will probably wind up on either my Dad's or husband's desk at work holding wrapped candy or small things they need at their jobs. They can also be repurposed to hold things like cotton swabs and such in a bathroom, decorated all sorts of ways. The ring- Were you one of those people who dumped out the whole box of cereal to get to the toy surprise? Or did you patiently serve up bowls waiting to get to it? There are people who just can't wait and dig for the ring. It's placement is marked with a foil disk on the inside of the container. You can also just let the candle burn. We opted to let it burn. Soy wax has a fairly low melt temperature, so when it got down far enough, I pulled the little foil pack with a pair of long tweezers. The ring is in a zip baggie wrapped in foil and won't be all encrusted with wax. They have rings worth anywhere from 10-5000 dollars in the candles. Obviously, most of them will be fashion rings worth about 10 dollars retail, but there are more expensive rings put in at random. The company would rather spend advertising money that way then on lots of ads. It works for them, they have a trading post where people can trade for the rings they would prefer, or trade with other people who got rings too big or too small. I'm not trading the ring I got, it was a 10 dollar fashion ring, but it just happens to be just the right size for my daughter, and it's her birthstone. It's a lot of fun! I already have the coupon code for the winner to get one free candle. So go enter! 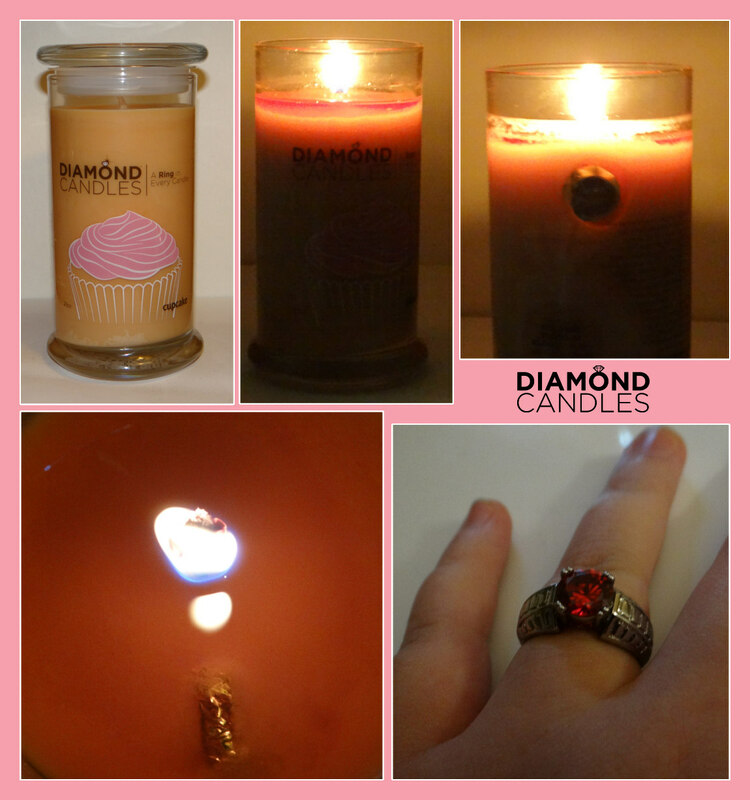 Part of entering is liking Diamond Candles on Facebook and they also have regular giveaways there for their candles.